Jewell James is Coordinator for the Lummi Treaty Protection Task Force and Chairman of the Board of the Kluckhohn Research Center. We will be visiting about Tar Sands, No Coal Trains, Water and Treaty Rights. contact Jewell James at email at jewellj@treatyprotection.org. 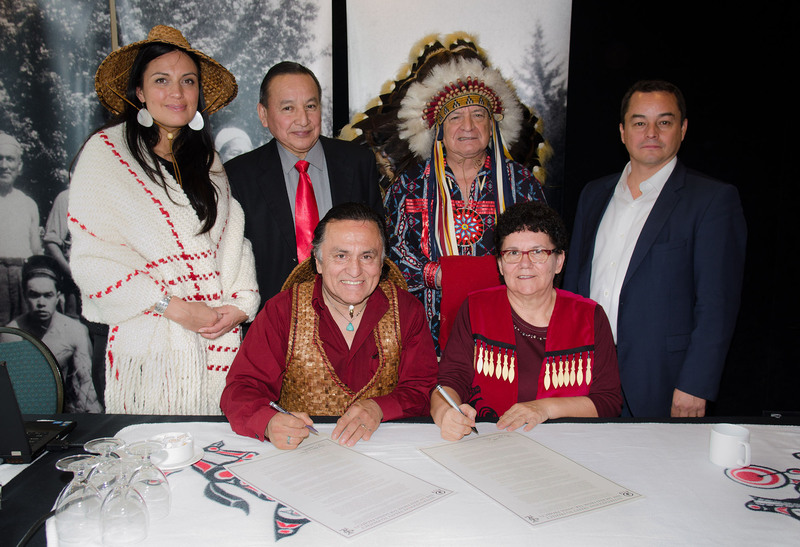 Image with caption: “Standing from right to left: National Chief Shawn-A-in-chut Atleo, Hereditary Chief Phil Lane Jr. of the Ihanktonwan Dakota and Chickasaw Nations, Grand Chief Stewart Phillip, and Deborah Parker, Vice Chair Woman of the Tulalip Tribes. Sitting in front right to left: Chief Maureen Thomas of the Tsleil-Waututh Nation, Jewell James of the Lummi Tribe. This entry was posted in Make No Bones Shows and tagged Jewel James on "Make No Bones About It." May 19th at 5pm, Lummi Nation, Salish Sea, Tar Sands. Bookmark the permalink.